NEW YORK – Believe it or not, the Trans-Texas Corridor is back. Very quietly, Gov. Rick Perry and the Texas Department of Transportation, or TxDOT, signed in October a comprehensive development agreement to construct a toll-road redevelopment of Interstate 35 north of downtown Fort Worth. Chris Lippincot, the former TxDOT information officer who is currently acting as the new public relations man for Cintra in the United States, also announced TxDOT signed a contract in September with Cintra to build a privatized State Highway 130 toll road in San Antonio. Perry may never have abandoned his original idea to build what during the presidential administration of George W. Bush was known as the Trans-Texas Corridor project, a 4,000-mile network of privately built and operated toll roads to crisscross the state, with Spanish development company Cintra scheduled to earn the tolls under 50-year leases. In 2009, Perry scrapped the TTC plan after a series of combative town hall meetings throughout the state showed TxDOT it faced massive taxpayer resistance. But now, the plan apparently is being implemented in small chunks, without the fanfare of divulging a statewide blueprint Perry and TxDOT may still have tucked away in their back pockets. Was TTC ever really dead? Operating below the radar of public opinion, Texas currently has $20 billion in roadwork underway through public-private partnerships, according to Ted Houghton, TxDOT chairman, the Texas Tribune reported earlier this month. Despite Perry’s pledge in 2009 to end the Trans-Texas Corridor project with Cintra, TxDOT has kept the public-private partnership toll road concept alive by proposing smaller projects for the approval of the Texas state legislature. Nicholas Rubio, the president of Cintra’s U.S. arm in Austin, told the Texas Tribune that Cintra currently has contracts for three road projects in Texas, consisting of approximately $5 billion in private investment against about $1 billion in public subsidies. In October, Perry and Rafael del Pino, chairman of Ferrovial, Cintra’s parent company in Spain, attended the grand launch of a 41-mile stretch of State Highway 130 P3 project between Austin and Sequin. Texas owns the land on which the SH 130 P3 project is built, but a private consortium owned and operated by Cintra is scheduled to build the toll road. It’s to be operated under a 50-year lease, with Cintra taking the lion’s share of the tolls collected over the next 50 years to recover construction costs and to make a profit. To make the SH 130 toll road palatable to Texas drivers, the speed limit will be set to 85 miles per hour, the fastest posted limit in the United States. 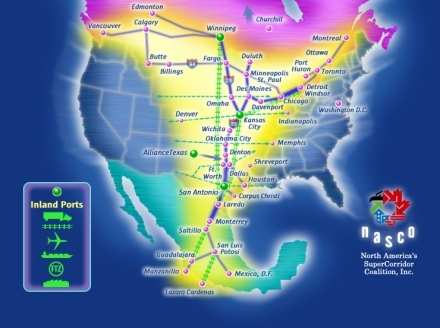 Quietly but systematically, the Bush administration in conjunction with Perry in Texas advanced the plan to build a huge highway, four football fields wide, through the heart of Texas, parallel to Interstate 35, from the Mexican border at Laredo, Texas, to the Texas border with Oklahoma. The Trans-Texas Corridor moved ahead to begin construction following the re-election of Perry in November 2006. Plans to build TTC-35 were fully disclosed on KeepTexasMoving.org, a now defunct official TxDOT website. On March 11, 2005, a “Comprehensive Development Agreement” was signed by TxDOT to build the “TTC-35 High Priority Corridor” parallel to Interstate 35. The contracting party was a limited partnership formed between Cintra Concesiones de Infraestructuras de Transporte, S.A., a publically-listed company headquartered in Spain, majority controlled by the Madrid-based Groupo Ferrovial, and a San Antonio-based construction company, Zachry Construction Corporation. The Cintra deal meant that once the TTC was completed, anyone who wanted to drive on it would have to pay an investment consortium in Spain for the privilege of driving in Texas. Although somewhat incomprehensible to most U.S. citizens, these public-private partnerships involve selling off key U.S. infrastructure projects to foreign entities. Granted, the “ownership” rights of projects like TTC-35 would have remained with the state of Texas, yet selling off the leasing rights amounts in the thinking of most U.S. citizens to selling off the highway to foreign interests for the term of the lease. Under the terms of the TTC agreements with TxDOT, Cintra would have had the rights to operate TTC-35 for 50 years and to collect all tolls on the road in that period of time. The Comprehensive Development Agreement called for Cintra-Zachry to provide private investment of $6 billion “to fully design, construct and operate a four-lane, 316-mile toll road between Dallas and San Antonio for up to 50 years as the initial segment of TTC-35. For this, Cintra-Zachry paid the state of Texas $1.2 billion for the long-term right to build and operate the initial segment as a toll facility. The April 2006 EIS made clear that Cintra-Zachry planned to build a 1,200-foot-wide (approximately four football fields wide) complex with 10 lanes of highway – five lanes in each direction, north and south.Three lanes in each direction would be reserved for passenger vehicles and two separate lanes reserved for trucks. The EIS design included six rail lines running parallel to the highway, with separate rail lines in each direction for high-speed rail, commuter rail and freight rail. Finally, the design called for a 200-foot wide utility corridor that would include pipelines for oil, natural gas, water, telecommunications and data, as well as electricity towers. According to the TxDOT Trans-Texas Corridor Plan adopted in June 2002, TxDOT ultimately would build some 4,000 miles of highway-railway-utility super-corridors throughout Texas over the next 50 years, using some 584,000 acres of what is now Texas farm and ranchland, at an estimated cost of $184 billion. The TTC plan left little doubt TTC toll-road super-corridors were designed to facilitate international trade, primarily speeding trucks and trains carrying “inter-modal” containers from Mexican ports to destinations in the heartland of the U.S. The full TTC build-out was designed to move goods through Texas rapidly, bypassing the major cities. University student participants from Mexico, the United States and Canada participate in a week-long simulation exercise simulating a congressional meeting between North American legislators. The North American Center for Transborder Studies (NACTS) at Arizona State University will co-host the 2011 “Triumvirate” at the Tempe campus. For five days, participants will discuss hot political topics affecting North America: immigration and guest worker programs, green building practices, corporate social responsibility in the mining industry, and the promotion of North American trade corridors. 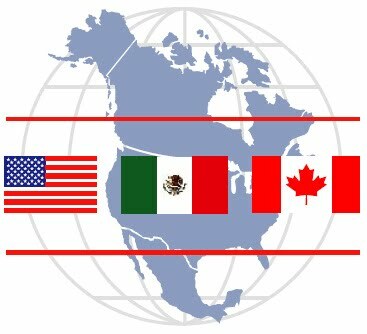 As a pioneer on the political scene, the Triumvirate seeks to bring together future North American leaders to increase their awareness of the issues that characterize North American relations while enabling them to develop a better knowledge of democratic institutions and the realities of the member countries of NAFTA. Triumvirate seeks to strengthen a sense of belonging to North America and discuss regional integration issues. “The event is a bull’s-eye target for NACTS’ work and commitment to social and economic development in the Americas,” Van Schoik said. “The simulation enables participants to delve into the heart of the North American political dynamics and to negotiate draft bills that, we hope, will inspire our political leaders,” Christine Fréchette, executive director and founder of NAFI, said. In a further indication that the “North American Union” agenda is quietly proceeding under what remains of the Security and Prosperity Partnership initiative in the Obama administration, DHS Secretary Janet Napolitano signed, with little fanfare, an agreement in Mexico that would extend special “trusted traveler” access to the U.S. to an estimated 84 million Mexicans. “In Mexico City, Secretary Napolitano and Mexican Ministry of the Interior Secretary José Francisco Blake Mora signed an agreement expressing their intent to develop a Global Entry international trusted traveler pilot program between the United States and Mexico – leveraging the success of the United States’ Global Entry program to facilitate secure, legitimate travel between the two nations,” announced a DHS statement Nov. 30. In September 2006, WND reported that the Department of Transportation, acting through a Security and Prosperity Partnership “working group,” was preparing to issue North American biometric border passes to Mexican, Canadian and U.S. “trusted travelers,” according to documents released to WND under a Freedom of Information Act request. The Security and Prosperity Partnership, or SPP, was announced by President George W. Bush, together with then-Mexican President Vicente Fox and then-Canadian Prime Minister Paul Martin at a press conference at the end of their trilateral summit meeting in Waco, Texas, March 23, 2005, without any U.S. congressional approval as a treaty or international agreement. Under the SPP, the U.S., Mexico and Canada organized some 20 different “shadow government” bureaucratic working groups composed of agency heads and undersecretaries in the three nations. The groups spanned a wide range of policy areas, from e-commerce, to aviation policy, to borders and immigration, trilateral travel, transportation, energy, environment, food and agriculture, health and financial services. WND has frequently reported, beginning in 2006, that the SPP was intended to implement a stealth plan to produce a North American Union composed of the United States, The agreement Napolitano signed with Mexico Nov. 30 appears to bring the SPP working group “trusted traveler” commitment closer to fruition. The Transportation Security Administration refused to answer a WND inquiry regarding whether trusted traveler cards issued to Mexicans would allow the holder to avoid the new U.S. enhanced screening with full-body backscatter X-ray machines. As described on the U.S. Customs and Border Protection website, the trusted traveler program allows applicants to receive a biometric border pass to facilitate cross-border travel. The recipient must undergo a thorough background check against criminal, law enforcement, customs, immigration and terrorist files, including biometric fingerprint checks and a personal interview with a CBP officer. The trusted traveler network is more thoroughly described on the “Global Entry” website maintained by U.S. Customs and Border Patrol. “Global Entry is a U.S. Customs and Border Protection (CBP) program that allows expedited clearance for pre-approved, low risk travelers upon arrival in the United States,” the CBP website proclaims. Richardson reported that Mexican Ministry of the Interior Secretary José Francisco Blake Mora said that 84 million Mexicans could qualify for the Global Entry program. Canadian Prime Minister under fire for secret border negotiations with U.S.
Canadian Conservative Prime Minister Stephen Harper is under fire in parliament for negotiating in secret an agreement with the U.S. on border security. Parliament has not been kept informed. Canadian Prime Minister Stephen HarperStephen Harper says that he has not yet reached a border security deal with the U.S. However he also said that his government is planning to bolster both security measures and economic access at the border.In the House of Commons Harper can been criticized for negotiating a deal that may have implications for the privacy of Canadians and Canadian sovereignty without any debate in parliament. The Liberal opposition leader Michael IgnatieffMichael Ignatieff called on Harper to reveal the details of the negotiations Harper has been having with the U.S. government.The Conservatives have engaged in the typical crapola in response to questions from reporters and opposition critics. The government avoids questions and neither confirms nor denies that negotiations are even taking place. This is a certain signal that they are taking place. Ignatieff pointed out that Harper was evading the questions. But then what are politicians for if not avoiding questions. Ignatieff said that Harper should be forthcoming about the implications of any agreement for immigration policy, charter rights and security. 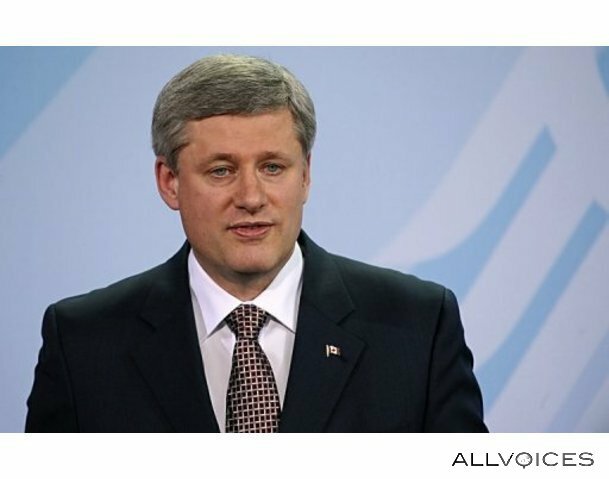 Harper said there was no agreement but that he was always looking for ways to strengthen Canadian security and strengthen the economy. Typically pleasant platitudes with no detail at all. Actually there have been document leaks. We even know the title of the deal is “Beyond the Border: A Shared Vision for Perimeter Security and Competitiveness”. It is supposedly to be signed by Harper and U.S. president Obama next January. There is yet to be any discussion in the Canadian parliament. Apparently the agreement will give the U.S. government more influence over Canada’s border security and immigration controls. Canada would also share more information with American law enforcement agencies. Harper is a great admirer of the U.S. especially the conservative movement there. In return for Canada ceding more influence or control to the U.S. the U.S. would ease up on controls at the Canada-U.S. border, reducing congestion and increasing the flow of two-way trade. One would think that the U.S. would try to do this in any event agreement or not. After all it is U.S. business that are importing and selling the goods or U.S. manufacturers receiving materials. Gilles DuceppeGilles Duceppe leader of the Bloc Quebecois the third opposition party said that he thinks that the agreement could very well be broad in scope resembling a treaty. That being the case the deal should be subjected to a binding vote in parliament. Don’t expect the Conservative government to buy that line. Harper will use his skills to avoid discussion and present the public with a fait accompli. The Conservative government is set to announce a landmark security and trade deal with the United States, designed to create a perimeter around North America and allow people and goods to flow more freely across the border. Sources suggested that Prime Minister Stephen Harper and President Barack Obama will sign the broad-ranging agreement in Washington as early as next month. The New Border Vision is being billed as a 21st century border management system that will include new common consumer product regulations, a pre-clearance agreement for goods crossing the border to expedite waiting times and the use of advanced technology to utilize biometric data for travelers at airports and land crossings, according to people familiar with the plan. The new framework will likely be discussed when the U.S. Secretary of State, Hillary Clinton, visits Ottawa this Monday but government sources said the announcement will not be made by Ms. Clinton. A spokesman for the Public Safety Minister, Vic Toews, said: “No such announcement is planned. We don’t comment on hearsay or speculation.” A spokeswoman for the U.S. Embassy in Ottawa refused to comment. Colin Robertson, a senior research fellow with the Canadian Defence and Foreign Affairs Institute, said the agreement is an attempt by the Canadian government to link security to improved access to the U.S. for Canadians. The U.S. announced a similar deal with Mexico in March. It included moves to expedite travel and commerce such as secure transit lanes for pre-cleared rail and truck shipments, as well as passenger pre-clearance for individuals. Business is likely to welcome a more coordinated perimeter approach to regulation and security but one exporter remained skeptical. “A vision without money is a hallucination,” he said. The U.S. and Canada have taken piecemeal steps to coordinate their efforts against common threats like terrorism. Last year, Canada signed on to the NEXUS membership card and Free and Secure Trade (FAST) trusted traveller programs as a valid means of identification at the border. However, more sweeping agreements have foundered in the past, notably the Security and Prosperity Partnership agreement signed in 2005 by former Prime Minister Paul Martin, ex-U.S. President George W. Bush and former Mexican President Vicente Fox. The SPP was aimed at reducing the cost of trade and improving the flow of people and information but became a lightning rod for criticism on both sides of the border. In the U.S., CNN anchor Lou Dobbs argued the SPP was part of a plan to merge the U.S., Canada and Mexico into a North American Union, while a number of organizations criticized the agreement for its secrecy. In Canada, NDP leader Jack Layton said the process was not just unconstitutional but “non-constitutional” because there were no oversight mechanisms. By 2009, all three governments had abandoned the SPP, which is “no longer an active initiative,” according to its website. Mr. Robertson said that increased integration could impact areas like immigration and refugee policy but was unlikely to lead to a European Union-style agreement. “Economic union would mean a common currency and, over the last couple of years, it has been definitively proven that we are far better off with our own currency,” he said. Under the Bush administration’s SPP, the U.S., Mexico and Canada organized some 20 different “shadow government” bureaucratic working groups composed of agency heads and undersecretaries in the three nations. The groups span a wide range of policy areas, from e-commerce, to aviation policy, to borders and immigration, trilateral travel, transportation, energy, environment, food and agriculture, health and financial services. WND has reported since 2006 that a blueprint published in 2005 by the Council on Foreign Relations entitled “Building a North America Community” called for the establishment of a common security perimeter around North America by 2010 to facilitate the free movement of people, trade and capital between the three nations of North America. In his 2001 book, “Toward a North American Community,” American University professor Robert Pastor, a co-chair of the CFR blue ribbon committee that authored “Building a North American Community,” called for the creation of a North American Commission, a North American Parliament, and a North American Court on Trade and Investment. The language of the documents declaring “A New Border Vision” with Mexico and Canada could easily have been lifted directly from the CFR report or Pastor’s book. Similarly, the U.S. State Department fact sheet calling for “A New Border Vision” with Mexico specified five areas of “joint border management, co-responsibility for cross-border crime, and shared commitment to the efficient flow of legal commerce and travel,” namely: enhancing public safety, securing flows of people and goods, expediting legitimate commerce and travel, engaging border communities, and setting policy. This provides additional support for the conclusion that the bureaucratic “working groups” established under SPP in the Bush administration will continue to operate under Obama administration. But it’s been exhumed, now appearing on numerous government and industry alliance websites as the new and separate projects that areknown as the I-35 Corridor and the I-69 Corridor. Moreover, the Texas agency appears to have made a strategic decision to begin first with the I-69 Corridor portion that had received less attention during the battle that raged over the mega-highway project called the Trans-Texas Corridor from 2006 to 2008 when George W. Bush was president.